I haven’t always lived a healthy lifestyle and my body definitely let me know that it wasn’t pleased with the way I was living and eating. Stomach aches, acne, low energy, irritability, hormone imbalances, constant infections…just to name a few. Once I began to give my body some love, it started loving me back by becoming free of these symptoms. Stress was a major factor in my life, and I needed to give my entire life an overhaul, but I started with what I was eating. That seemed like the easiest thing to begin with since I had no clue where to even start managing the stressors in my life at the time. On my journey to becoming the Contagiously Positive Girl, dubbed by a man I worked with, I become a health-nut junkie. I dove head first into the deep end of nutrition. Food is always a great place to start when it comes to your health and your happiness. You cannot have a healthy mind without a healthy body and you cannot have a healthy body without a healthy mind. If I look back at the early days when I had an eating disorder, I absolutely know this to be true – without a doubt! One way to give your body love is to eat good food. Food that is not only healthy, but also tastes so delicious that you want to eat it every single day. Here are some simple tools that I continue to use even 10 years after my own journey began and now teach in The Contagiously Positive Woman’s Guide To Healthy Living. If the food you eat is deficient and toxic, your body and mind will also become deficient and toxic. As much as you can, avoid foods that have a longer shelf life than you do. If you want to treat yourself, do it, but don’t make it a regular part of your diet. A treat can no longer be considered a treat if it is eaten three times a day, every single day. Your body is similar to constructing a building. You need proper materials to make it structurally sound, strong and long lasting. The proper materials your body needs is nutritionally dense food. For example, fruits, vegetables, plant proteins, organic meats, and whole-grains. Food Matters! 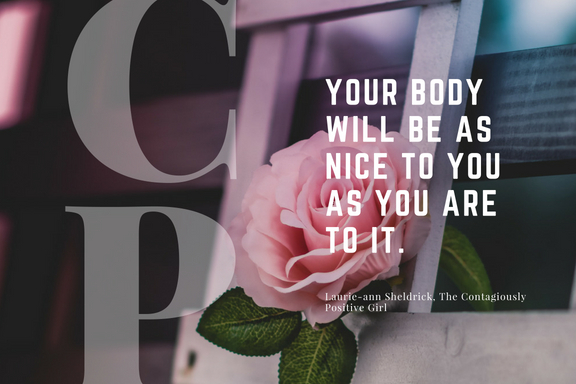 It matters to you, to your body, to your mind and to your entire well-being. Only you can feed it what it needs. Nourish your body and your body will work to fix itself. This may sound too simple, but it is exactly the way our bodies are designed. Each and every one of our bodies can heal themselves when we give it the nutrients it needs. Only you have the power to feed it what it needs, so learning how to cook, even just the simplest of meals is necessary for long-term health. I’m always asking my clients, “When did cooking become optional?” If you eat real, made from Mother Nature food and learn how to make delicious meals more than you eat take-out, and processed foods, you will be so much healthier and happier. You don’t have to be a gourmet cook either. Cooking doesn’t have to be complicated or have expensive exotic ingredients. Find your favorites and dose them up with lots of healthy vegetables. If you really want to up your health game, listen to your body. Trust me, it will always tell you what’s up. It might be telling you right now. If you eat something and it makes you feel tired, nauseas, sick, gives you a rash, or you experience stomach upsets, that is a sign that you might not want to eat or drink that specific food. Your body will never lie to you. If you can pay attention to the signs (symptoms), you will be able to avoid a lot of unwanted discomfort, which will make you feel healthier and happier. When we are mindful, we become connected with our bodies. Began by being mindful of what you are eating and how much you are eating it. Be mindful when your body needs to move or when it needs to rest. If every month you are feeling like you need a full body detox, you may not be being mindful of what you are eating. If you have pasta for lunch, keep the portions smaller and don’t eat it for dinner. If you want a bowl of chips, have the chips; just don’t eat the entire bag. If you want to have a glass of wine, have the wine, but be mindful of how much you are drinking. If you love chocolate, have the chocolate, but be mindful of how much you are eating and eat one small square instead of the whole bar. When you have a treat, enjoy it, savor it and love every bite. You never have to deprive yourself of things you love when you are being mindful. Don’t deprive yourself. When you want the treat, have the treat and know that you haven’t created diet homicide. Stop counting every single calorie. Calories are not created equally so eating 100 calories of processed foods is no better than 200 calories of real mother nature made food. Find a bunch of healthy meals and recycle them. Meaning, know what you like and don’t try to reinvent the wheel when you just don’t have the time or energy. You don’t have to make a different meal 3 times a day, 7 days a week. And you don’t have to follow one dietary lifestyle like Paleo, Vegan, Vegetarian, Keto to be healthy. Find what you like. If it makes you feel good, stick with it. Start with one small change at a time. You don’t have to give yourself an entire dietary overhaul all at once. Start with brown bagging your lunch, or making a healthy breakfast, or even just eating breakfast. One small change at a time packs a huge punch. Remember, if you love your body, your body will love you back.